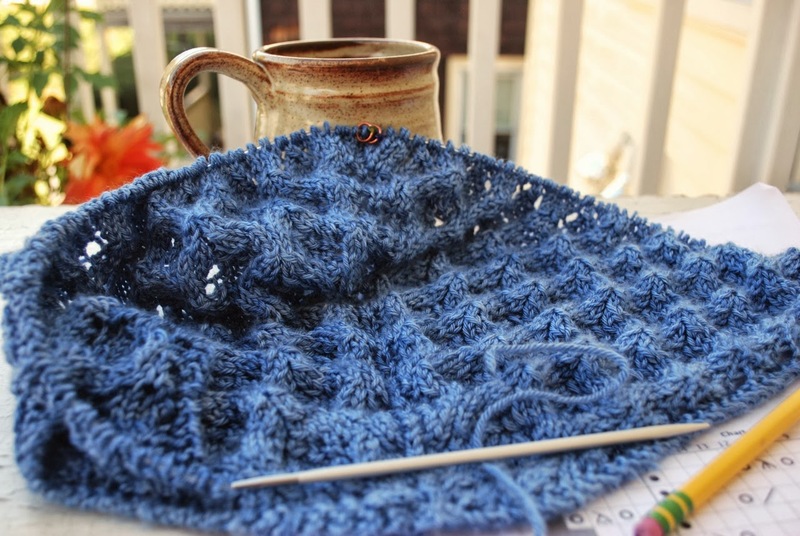 Welcome to another round of the Holla Knits Blog Tour. Earlier this month, Holla Knits released a Fall / Winter pattern collection. One of the designs, Eastwood Cardigan, features Clara. This worsted weight, 100% Blue Faced Leicester yarn is perfect for fall and sweaters. Eastwood Cardigan utilizes two-color striping on the sleeves and back. The front panels are solid and have a stitch pattern for texture. To celebrate the launch of this collection, I'm giving away a copy of Eastwood Cardigan. 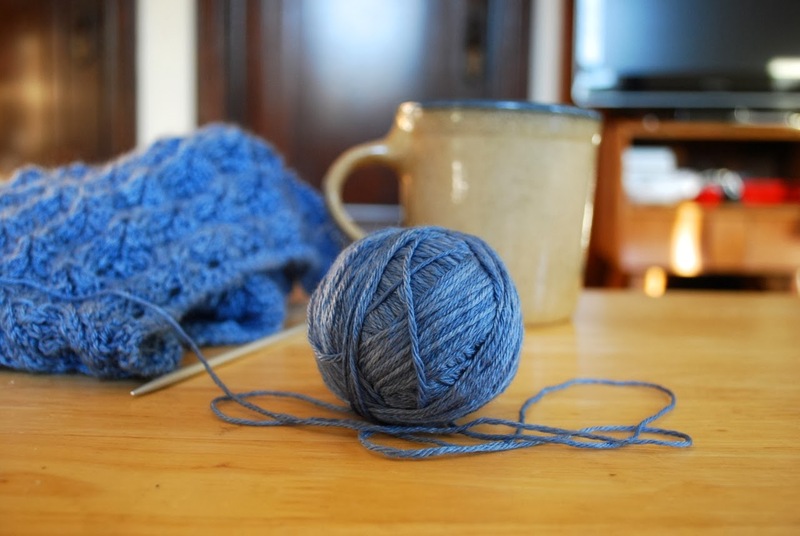 Simply leave a comment and let me know what you're knitting this fall. The winner will be chosen at random, and the contest runs through October 4, 2013. 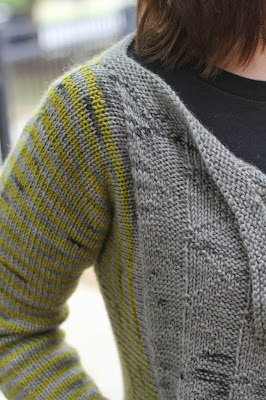 Here's a complete list of the Holla Knits Blog Tour. Be sure to check out the other stops for more giveaway fun. 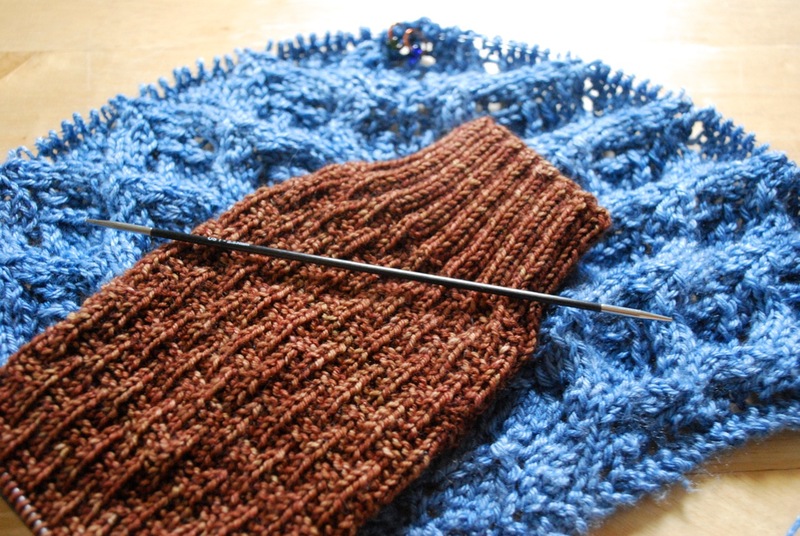 Progress is moving forward with my Dover Castle Shawl. I'm still optimistic that it will be finished for the weekend. 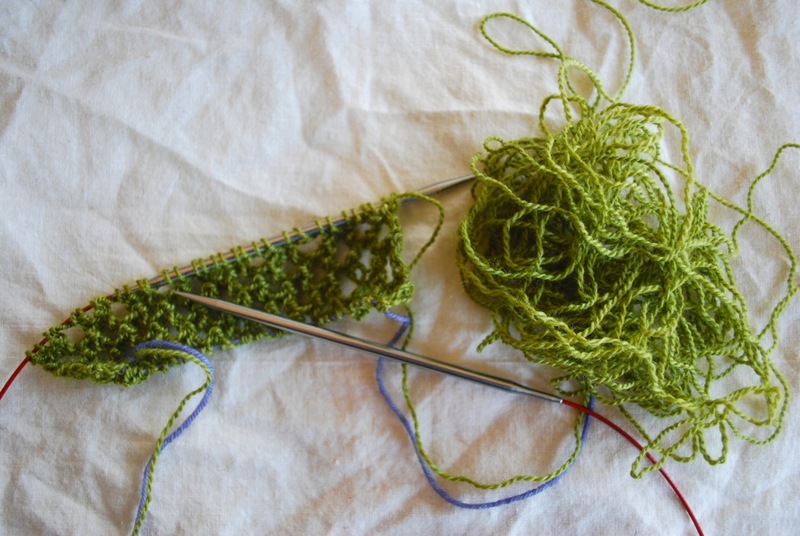 I've just started the border, but for the last couple repeats of the body, I was caught in a vicious cycle. I would knit a couple of rows, weigh the ball of yarn. Knit, weigh. Knit, weigh. All the while my stitch count was increasing, making any kind of mathematical prediction even more tenuous. Could I squeeze in one more repeat and have enough yarn left for the border? After several debates with myself, I called it quits on the body and moved on to the border. Right now I'm confident I'll have enough yarn to finish, but that confidence will undoubtedly erode as the ball gets smaller and smaller. 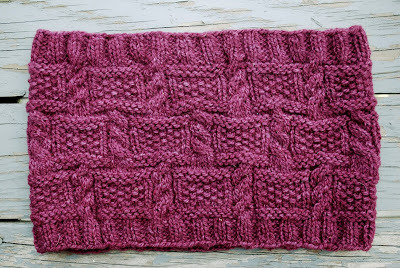 The border section is written for 16 rows, but the instructions say you can quit after any wrong side row. I'm going for the full 16. Since I made the body bigger, I don't want to cross the finish line with a skimpy border. There's one slight snag in my Dover Castle master plan. Later today I leave for KnitEast, and I'm doing the driving. This time I'm traveling with my blocking wires. I'm staying with a dear knitter friend who lives just this side of the Canadian border. I have visions of one of our late night chats over a pile of wet wool and a couple beers. If you want to follow along with the weekend adventures, I'll have live updates on Twitter. I also have a booth this weekend at Vermont Sheep and Wool, and there will be tweets from that event. Now I'm off to take care of last minute details . . . and make sure the wires and pins are packed. Booth Preview. If you've followed along here for any length of time, you know that I spend plenty of time talking about booth samples. I try to keep the booth fresh and interesting, and new samples are part of the process. My knitter friend, Robin, whipped this up in no time. Not only is Robin a capable sample knitter, she's a speedy sample knitter. This design includes instructions for two sizes and three weights of yarn - plenty of options to choose from. The yarn is Mavis Lace, colorway Coast. This blend has lovely drape with a silky shimmer and is perfect for elegant shawls. 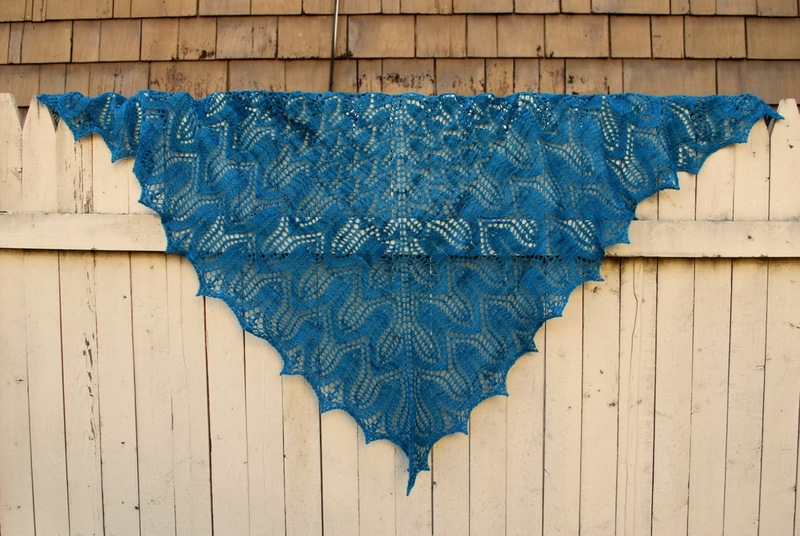 If you're headed to KnitEast later this week, you'll find Sunflower on display in my booth. I've been logging long work days, and I think the lack of sleep might be catching up with me. Sometimes my days consist of recreating colorways that I've dyed many times. It's like following a favorite recipe. I check the instructions once in a while, but for the most part I'm on automatic pilot. This is when my mind tends to wander. 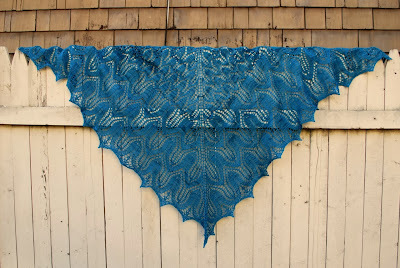 Yesterday I had the wild idea that it would be fun to have a new shawl for my travels next week. Now I'm not crazy enough to think I could start a new project and finish it in time. Instead, I did a quick survey of my works in progress. I don't have many projects on the needles, so the pickings were slim. In the end, I realized I have only one project that stands a chance of being finished by next week. Dover Castle Shawl - the current Yarn Knot project. 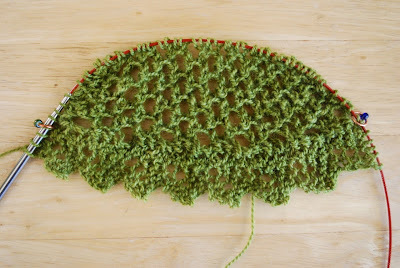 I've completed the suggested number of pattern repeats for the body and have decided to add more. Now the question is how many should I add? I have to leave enough yarn for the border. Adding to the body only to run out of yarn on the border would probably push me over the edge. I'll make a guess and hope for the best . . . something to ponder while I work my way through my dyeing list. It seems that every time I turn around I notice more and more colors changing to autumn tones. 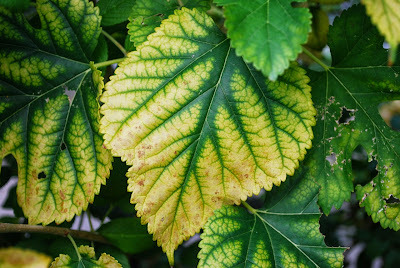 I captured these leaves in mid-change . 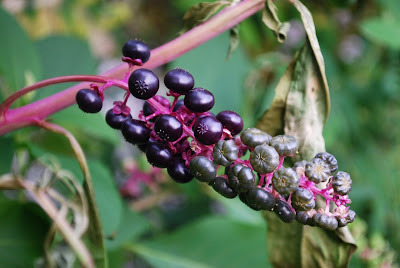 . . my color inspiration for the week. I've been picking and choosing colorways to offer at the fall shows. Some colorways are long-running staples, others come and go. Different lineups, different rotations. So many decisions to make. 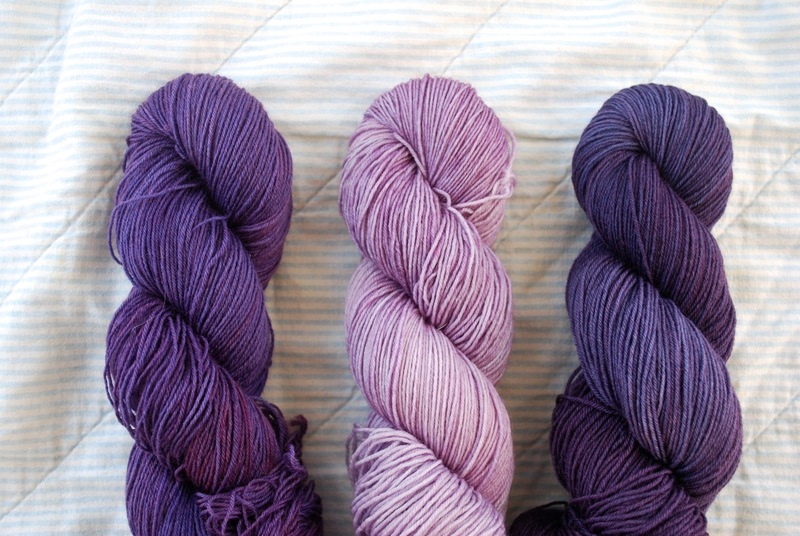 This fall, I've expanded the color list for some of the yarn lines. For example, I'm including more colorways of Paula. Violet, Orchid, Spooky. Plenty of purple to go around. More colors, more options, more fun for everyone. Production Update. I spent part of this past weekend winding skeins for Dipped Infinity Kits . . . winding and winding and winding. 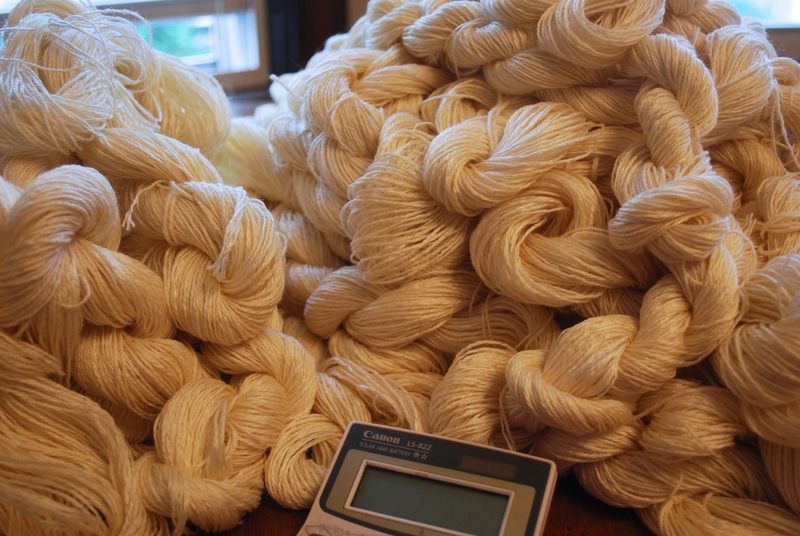 Winding is probably my least favorite task in the dyeing process. It's so boring that my mind wanders, and all I can think of is other jobs that need attention. Then I take it one step further and get frustrated because I'm chained to the winder and can't do one of the million other things that need to be done. Sometimes I have music playing when I wind, but usually that doesn't help while away the time. Often I listen to Red Sox games. Slow, deliberate baseball games make me feel like I'm zipping along with my winding. It's all a matter of perspective, I guess, so I play these little games with myself. Like the counting game. When I was at the winder this weekend, I told myself I wasn't going to count the skeins as I was winding. I need a lot of these little skeins, and sometimes it's best not to count as I go. Then when I'm done winding for the day, I count. The goal is to be pleasantly surprised at the numbers instead of terribly discouraged. The pile is impressive, but after counting, I'm only a third of the way there. If anyone is looking for me, I'll be at the winder. Being my own boss has many advantages. I have a lot of flexibility and set my own schedule. I can work long days or short days. I'm sure you can see this isn't always an advantage, but it does give me plenty of options. I get to make all the decisions. Usually I enjoy that part of the job, unless the decisions are hard. I've had plenty of hard decisions lately. That's when I don't like being the boss. The last couple days I cut myself some slack in the dyeing department. I'm the boss, so I get to make that decision. Summer returned with a vengeance, and I decided I wasn't going to add to the heat and humidity with long days of dyeing. Besides I had enough other work - bookkeeping, labeling, winding. OK, I may have given myself a little extra knitting time. Just a little. Today it's rainy and cozy. It's a perfect day for knitting, but I have to put the needles down. In addition to everything else that needs attention, I have to pack for tomorrow's trip to Portland. It's a nice reminder that sometimes the decisions are easy. I discovered this week's color inspiration in some dry bushes. It's a lovely color combination. After my recent lace knitting escapade (see previous post), I realized I needed another project to balance the mental gymnastics that lace sometimes requires. I'm out and about a lot this week with meetings and appointments - all places where I could be knitting but where I shouldn't be working on lace. I needed a portable knitting project that didn't require too much concentration. The obvious solution was a sock. Since I didn't have one in the works, I went in search of a new pattern. I looked here, there and everywhere - online, in books, through pages of patterns I keep ready and waiting. When all was said and done, I landed back at Knitspot. Movie Night Sock. My last three pairs of socks were Anne Hanson designs. The streak continues. 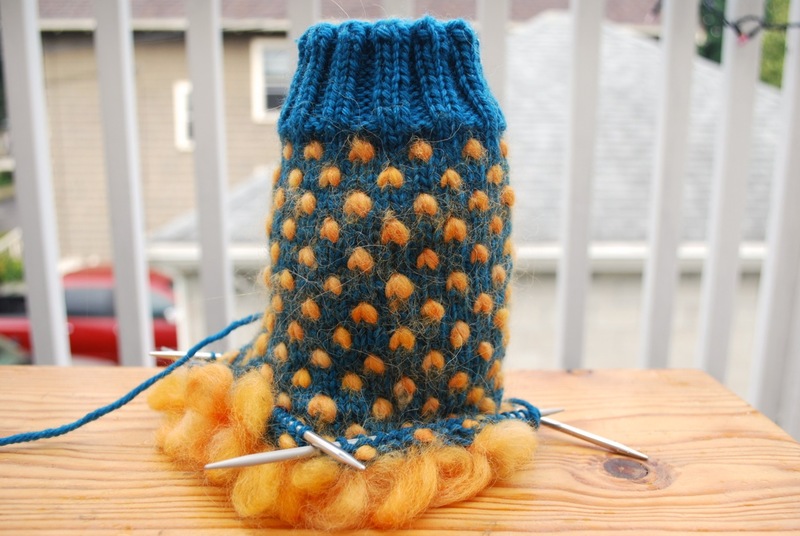 The yarn is Lucia, colorway Toffee. I had forgotten how much I like this color. Recently when I was sorting through inventory, I pulled the Toffee because it was an orphan skein. At first I was thinking of a different color for these socks, but then I remembered the Toffee. I wound the yarn and cast on without giving it a second thought. It's time for me to pack my bag and head out the door. Now that I have a sock on the needles, I'm ready for whatever comes my way. 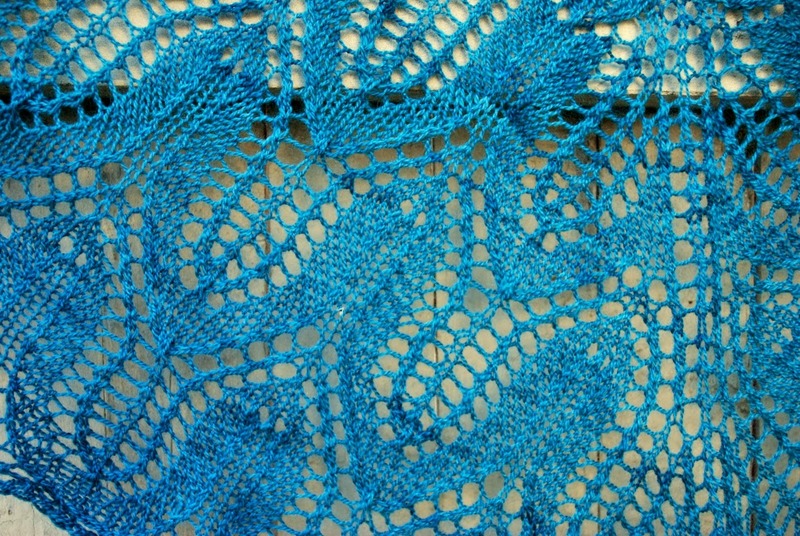 I love knitting lace. It doesn't matter if the pattern is plain and simple or elaborate and detailed. I trust that all I have to do is follow the instructions - yarn overs paired with just the right increases and decreases. 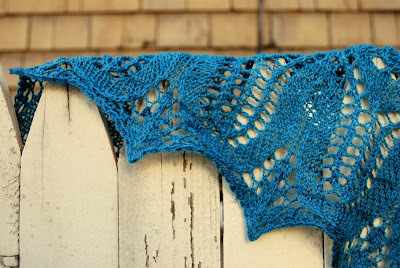 Sometimes knitting lace is like wandering a labyrinth, and I follow along blindly. In the end, I'll have a nondescript blob of knitting that will be transformed through the magic of blocking into something wonderful. The beauty of lace is that it never lies. That's one of the things I love about it. 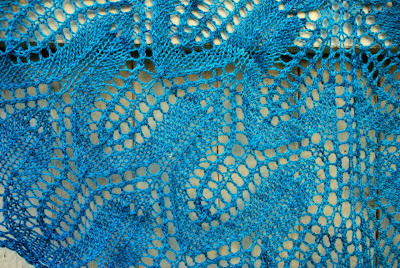 Lace knitting is precision knitting. I follow the pattern and, if it's written correctly and I follow the instructions, my knitting should work out stitch for stitch at the end of every row and every section. 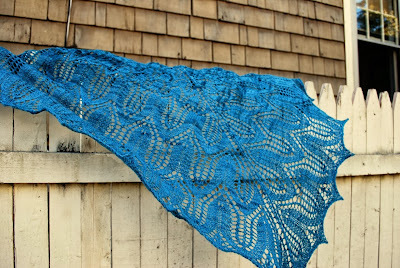 It's ironic that what I most admire about lace knitting also annoys me the most. It never lies. If I work to the end of a row and I'm off by a stitch or more, it's time to backtrack, count and recount. Either I'm wrong or the pattern is wrong. When I check online for pattern errata and don't find any, the burden rests on me to find the mistake. Even if I'm off by just one stitch, I will find the mistake. Yesterday morning I had some productive knitting time while waiting for my daughter to complete a fundraiser walk. Things were moving right along until I can to the end of a section and realized I had an extra stitch. One extra stitch. I dissected the pattern, counted and recounted. Somewhere I was off on the math, and it became a personal challenge to sort it out. Sorting out often leads to ripping out. I found my mistake. If I start a section with one extra stitch, that extra stitch will come back and bite me. I assumed my stitch count was on target heading into that section. Had I taken ten seconds and counted my stitches, I would have realized I was off by one. Back on track and ready for the next section. Yes, my stitch count is correct. I've counted. And recounted. I started the day with a reality check from my husband. "It looks like you're behind in your dyeing." If he thinks I'm behind, I'm more behind than I thought I was. It's time to pick up the dyeing pace. But in the "look what I have accomplished" department, I finished two lingering knitting projects. Not one. Two. Granted, they were both well underway and they're both small, but there's nothing like empty knitting needles to give me a little boost. Sometimes I have to create my own positive feedback and finishing projects is a great way to do it. I know it's not a pair. 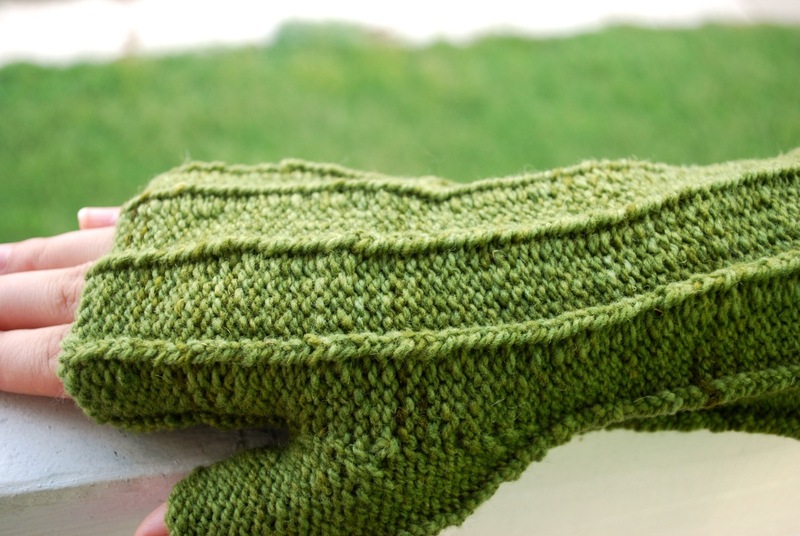 This is a booth sample and I only need one mitt, but I started it just the other day, and now it's in the finished pile. Some day I do want to make a pair for myself if I ever have time for self-indulgent knitting again. 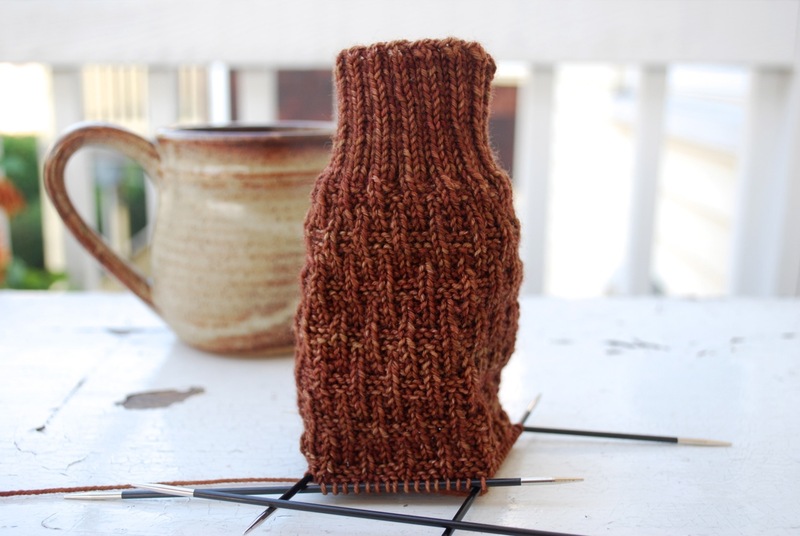 This design features reverse stockinette worked on the wrong side for minimal purling. The yarn is Oma's Organic, Peat Moss. One skein equals a pair. 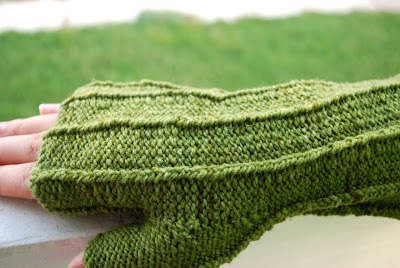 Not to instill any panic, but these mitts would make a nice gift item if you're thinking ahead. Also featuring Oma's Organic . . .
Woodstacking Cowl in Byzantium. Last year I made this cowl in a different color to give it a test run. I liked it so much I decided to make it a regular feature. The fabric is full of depth and texture . . . cushy comfort. This is another one skein project that knits up quickly. Since I finished two projects, I feel fully justified in starting something new, but I'll save that for later in the weekend. My husband is right. It's time to jump-start the dye pots. I've already noticed some leaves changing color, so when I found this hidden in a hedgerow, it caught me by surprise. It had to be my color inspiration for the week. 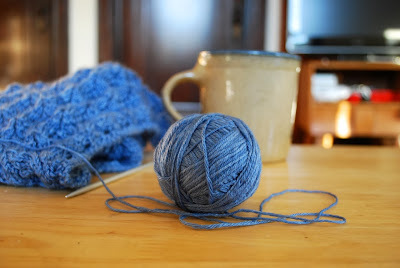 With my thrummed mitten temporarily sidelined, I had no choice but to start a new project. I hated to leave the mitten high and dry, but in the long run it's a good thing. I have a lot of running around to do this week, and a thrummed mitten doesn't make a very good traveling project. On the needles . . . more handwear. 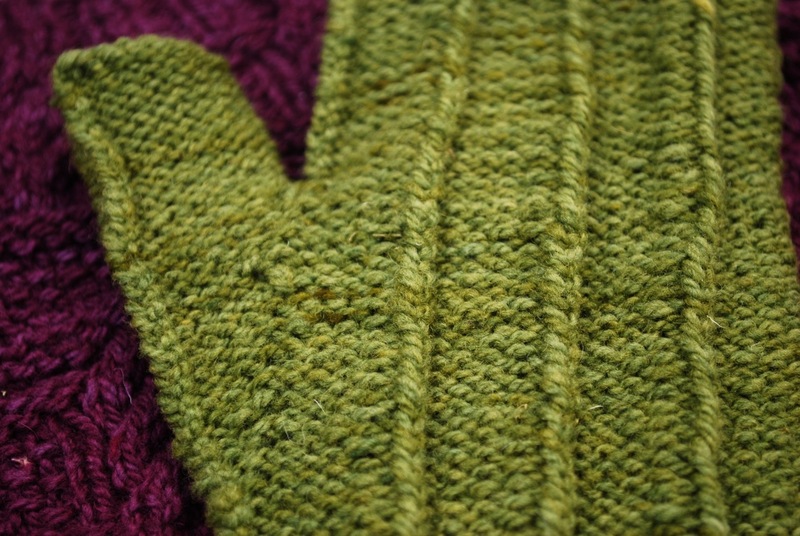 Doric Mitts by Becky Herrick. 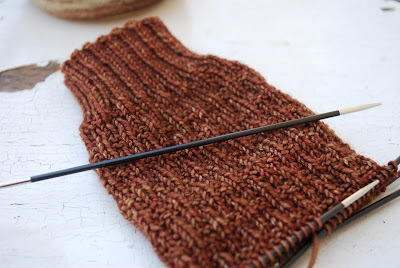 This mitt is moving right along, and I'm almost finished with the thumb gusset. The design is reverse stockinette worked on the wrong side. When this is finished, I'll flip it inside out. When I set aside the thrummed mitten, I realized I don't have many projects in progress. I don't know how that happened, but I'm sure I can remedy the situation. I'm tempted to start a new shawl. The only thing holding me up is I can't decide on the color. Then there's a sweater pattern I need to revisit and another pair of socks waiting for me to dye the yarn. This project drought won't last much longer. 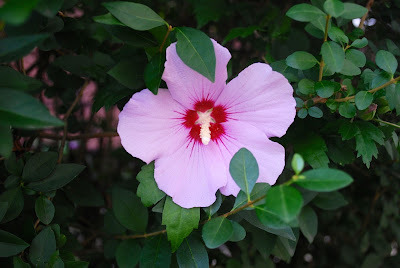 In the last few days I've read a couple of very insightful blog posts. Jill Draper wrote a thought provoking post about Labor Day, the US economy and being a conscientious consumer. On a related note, Abby Glassenberg raises some good questions in her post on the meaning of handmade. It's a complicated puzzle without easy answers. Food for thought. Work on my thrummed mitten has come to a screeching halt. Mitten production in my busy, busy workspace has come to a standstill. My mitten has gone on strike. I have to take this interruption with a smile. It is Labor Day, after all. OK, the mitten isn't entirely to blame. It seems there aren't enough raw materials to finish the job. Yes, I've run out of fiber. I was positive I'd dyed enough. 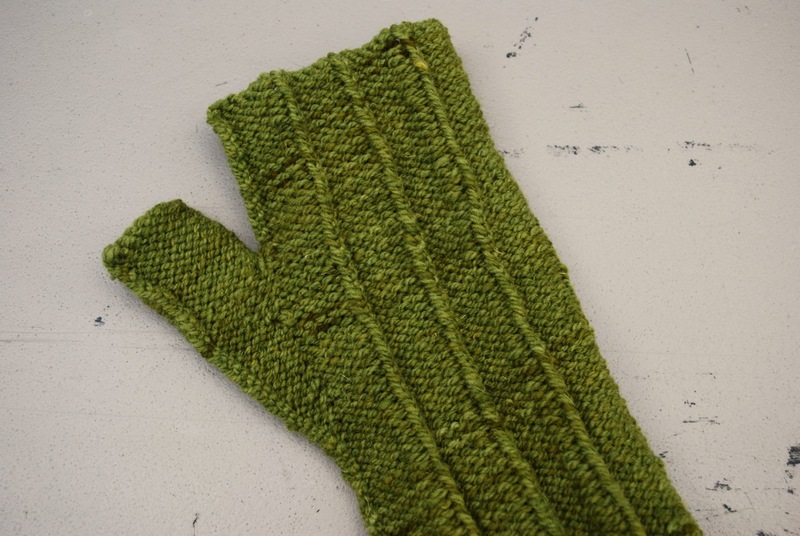 I based my calculations on thrummed mittens I'd made before and thought I would have plenty of fiber to go around. Wrong. And this is where the mitten is partly to blame. This pattern includes additional thrumming around the wrist and a thrummed thumb (say that fast a few times). I didn't take those two things into consideration, and that extra thrumming here and there was just enough to cause a fiber shortage. 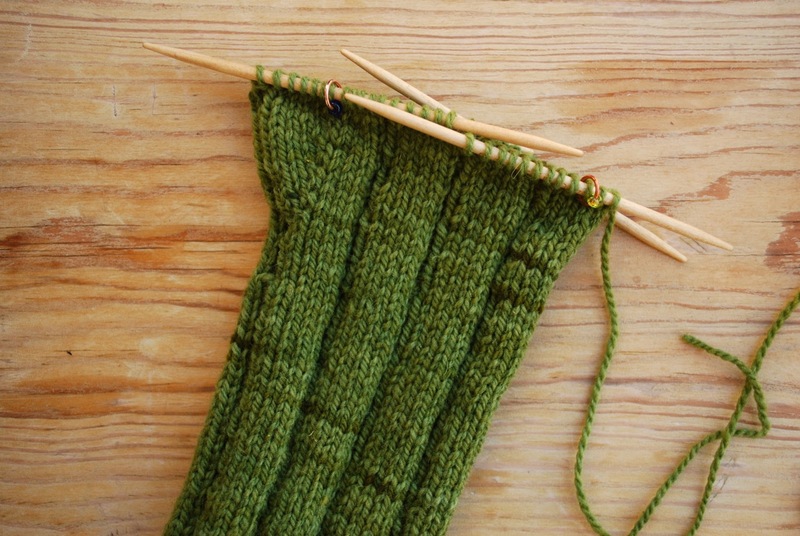 As I was heading into the thumb gusset I had a sickening feeling I might run short of fiber, but I didn't listen to that inner voice. No, instead I kept thrumming along . . . hoping for a miracle of biblical proportions that, out of nowhere, would provide enough fiber to go around. I've added more thrumming fiber to the dyeing queue, but I won't let this mitten close down all production. I have a fingerless mitt waiting in the wings, and it's more than happy to work today.